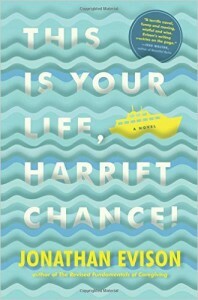 Harriet Chance has always taken a back seat in her life. As described in the novel, she’ “cheap” with herself. She decides to take a chance on a trip, not knowing that she’ll soon discover everything she’s known is turned upside down. Harriet Chance just spent the last two years of her life caring for her husband during his rapidly declining mental health. Two years after his passing, she gets a call telling her he’s won a cruise to Alaska. Against what’s normal for her, she decides to go and invites her spontaneous best friend on the trip. At the last minute, her friend backs out. Sending a cryptic letter explaining the absence. What follows are glimpses into Harriet’s past and the way that Harriet has justified her life and treatment from Bernard during their marriage. The picture painted is very different than what Harriet has created in her mind. The tale that Jonathan Evison weaves in this novel is in turns hilarious and tragic. You meet Harriet’s adult daughter and learn things about Harriet that change your view of her. Overall, I think younger generations get the idea of the “cute little old lady,” and Evison tosses that to the wind. You get to know Harriet as an individual, you see how she’s treated as a senior citizen, and you are challenged in the way YOU treat those in generations before you. As the novel unfolds, Evison uses flashbacks that are tied to what’s occurring in Harriet’s present. This is the PERFECT way to incorporate flashbacks into a novel. It’s relevant to what you’re reading, and it doesn’t feel jarring like flashbacks used in other novels I’ve read recently. No spoilers, but the ending left me floundering. I was expecting something completely different, and Evison threw me for a loop. While I LOVED the novel as a whole, the end left me unsatisfied.